Sardines are small, oily fish, eaten around the world in many different forms. They are particularly versatile when it comes to cooking, lending well to frying, grilling, curing, salting and smoking, as well as famously being found crammed in tins. Available from late June to February in the UK, sardines are sold whole, both fresh and frozen. 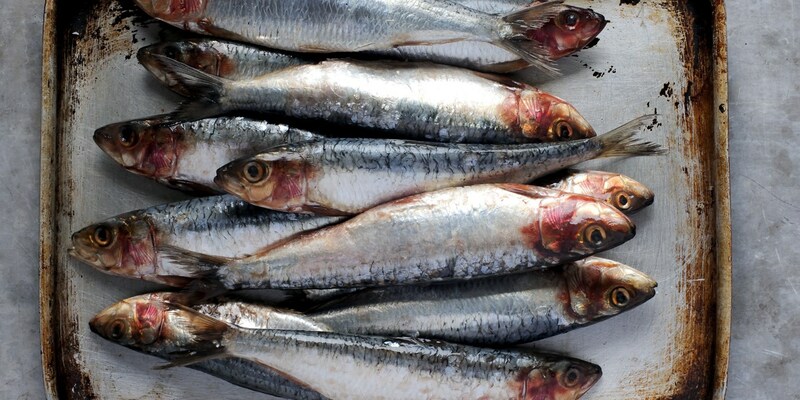 Pilchards are in fact the same as sardines - the name chosen depends on the age of the fish. If under 2 years, it is called a sardine and anything over is pilchard. Sardines are not just tasty - they are very rich in omega-3 fatty acids and B vitamins, both vital for a healthy brain and nervous system, so get eating these beautiful and relatively abundant little fish. Try to buy sardines that have bright eyes and shiny skin, with the scales intact, and pink flesh with a fine, soft texture. Cloudy eyes and discoloured skin are warning signs that the quality of the fish isn’t up to scratch. Whether you are cooking whole, butterflying or using the fillets, rubbing sardines with olive oil, salt and pepper before cooking makes for a deliciously unctuous fish. Another good general tip is to dress cooked sardines in lemon juice after cooking as Shaun Hill advises, this counters the intense oily flavour of the fish. Part of sardines' charm is that can be cooked quickly and easily, hence why they are often for breakfast. You can tell they are cooked when their flesh is firm, opaque and easily flakes away from the bone. When the weather is nice, whole sardines are perfect fish for the barbecue. They cook very quickly on a hot grill (3 - 4 minutes on each side) so make a beautifully quick and simple al fresco starter. You could also roast sardines whole in the oven and serve with a sauce. Sardines can be descaled, gutted and grilled simply, as in Nathan Outlaw’s recipe. Sardine bones are so small that you can eat them without too much worry. Robert Thompson and Shaun Hill advise butterflying the sardines to remove the backbone and fine bones from the flesh for a more refined finish. Sardine fillets can be grilled or pan-fried. Shaun Rankin and Adam Gray’s recipes both use grilling to great effect, first rubbing the fillets with olive oil, a knob of softened butter and a squeeze of lemon juice before grilling skin-side up until the flesh is cooked through and the skin is golden and crispy. Perhaps one of the simplest ways to cook sardine fillets is to pan-fry them - the fillets cook very quickly, and cooking skin-side down in a hot pan again allows for wonderfully crispy skin.